It seems that despite the fact that humanity has had orbiters in the sky and landers on the Martian surface since the 1970s, the Red Planet is still full of surprises. NASA’s Mars Atmosphere and Volatile Evolution (MAVEN) spacecraft has caught sight of something quite unexpected in the Martian atmosphere. High above the surface is a massive dust cloud, and a glowing aurora not unlike the Northern Lights on Earth. Both of these discoveries come as a big surprise to NASA researchers, since neither space dust nor these kinds of auroras have been observed over Mars before. MAVEN spacecraft measured the thin dust cloud from about 93 miles to 190 miles above the Martian surface. It wasn’t predicted, and NASA doesn’t know where it came from. It is also not clear if this is a temporary or permanent phenomenon. The space agency does say it isn’t a hazard to orbiting spacecraft. The dust might originate on the moons of Mars, in the solar wind moving off the sun, or debris left behind by comets. It might also have just drifted up from the surface. As yet, researchers are unaware of any mechanisms by which the dust cloud could have been created from any of these sources. 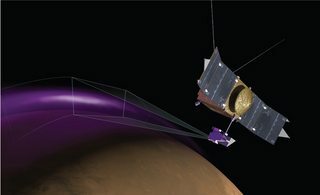 In the days before December 25, MAVEN also recorded a bright ultraviolet auroral glow in the northern hemisphere of Mars. Like the aurorae on earth, these are produced by solar radiation striking atmospheric particles and making them glow. Unlike the earth, however, the aurorae on Mars reach down much lower into the atmosphere. The light show on Mars wouldn’t be all that dramatic to a human observer, though. Without the abundant amounts of oxygen and nitrogen in the thin atmosphere of Mars the Martian aurora would be a dim blue glow at best and might not be in the visible sprectrum of humans at all. This isn’t the first time auroras have been spotted on the Red Planet. In 2004, observations with ESA’s Mars Express were actually the first time that the aurora phenomenon had been detected. The observations were made with the spacecraft’s SPICAM ultraviolet spectrometer and found that the auroras on Mars are not like those found anywhere else in the Solar System. They are generated by particle interactions with very localized magnetic field emissions, rather than a globally generated one such as the auroras generated here on Earth. The findings were presented at the 46th Lunar and Planetary Science Conference in the Woodlands, Texas recently. Bottom line: MAVEN, a part NASA’s Mars Exploration Program, was launched using Atlas V launch vehicle in November, 2013 and reached Mars on September 22, 2014. Since then it is orbiting the planet from an altitude of 150 km above Mars surface. The main aim of MAVEN mission is to study the Martian atmosphere and determine how Mars lost the major part of its atmosphere, water and other volatiles over time. In addition to MAVEN, agency’s other spacecrafts that are orbiting the Red Planet include the Opportunity and Curiosity rovers, Mars Reconnaissance Orbiter and the Mars Odyssey.